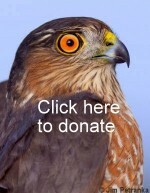 SAAR operates on-going bird migration monitoring, through songbird banding, raptor trapping, hawkwatch, and public education efforts each autumn at the Big Bald Banding Station (BBBS). SARR volunteers organize and lead on-going education experiences and education events on site at the Big Bald Banding Station and our MAPS project locations. Education programs have also been presented in classrooms at Hot Springs Elementary, Gardners Elementary, North Buncombe High School, Evergreen Community Charter School, Southern Pines High School and the North Carolina Center for the Advancement of Teaching. SAAR researches songbird breeding success and survivorship by operating 3 MAPS stations in western North Carolina. Learn more about our MAPS projects. SAAR volunteers also research the natural history of the Northern Saw-whet Owl in the northern hardwood habitat of Big Bald. Learn more and how you can participate.